For my sister's baby shower, I basically started my own "cheesecake factory." Now, I don't want to sound arrogant, but I'm just going to state a fact. Each time I go to a potluck/party and bring these, everyone raves and/or asks me for the recipe. And I think I've made this cheesecake 10+ times by now and decided to share the recipe with everyone...... now my only social charm is gone, I suppose. So for this endeavor, I used to crush these manually using a stick and large bowl. No more, now that this food processor is in my life! I like to crush these finely but not into powder. Four cheesecakes = LOTS of crumbs. This was the setup of the "cheesecake factory," the night before the shower. Eggs and cream cheese need to hang around for a while as to not be cold solid from the fridge. Four cheesecakes also equates to a LOT of butter. This butter needs to be melted. I prefer to do this over flame rather than microwave. Once it's melted and cooled a bit, mix it with the crumbs. Easy, right?! Pressing the crumbs into pans. I do NOT normally line with parchment, but this was for a larger crowd, so I did. Otherwise, you can lightly spray a pan. Dog not included, but he just wanted to say hai. My little sister Kwi likes to help me bake, and I really needed it this time. She helped me stir the jam to thin it out. I had to spread it over the crumbs, which is always my LEAST favorite part of the process. Try not to break your crumb layer during this part, though this is careful work. Don't forget to add your blueberries on top of the jam! The rest of the ingredients are beaten in a large bowl. This is why the cream cheese should be soft. Beat the cream cheese first before adding the eggs, sugar, etc. I didn't take pics of this part, because doing this 4x got a little hectic. But once it's all blended, it will be smooth and perfectly pourable. Not much different after 30 min of baking at 350. Let cool and refrigerate before slicing/eating. It's best cold (and the next day!). I have not tried making this in other flavors, though I'm sure it'd be just as good. Let me know if you happen to try it. Blueberries are my fave, though. I have a great key lime cheesecake bar recipe using cressant rolls for the bottom and top layers. no bueno warm...I found that out the sad way. But amazing idea with the jam and blueberries! I may have to incorporate that idea. I wish I could have had some. Looks so smooth in the second to the last photo. Cute photo of Brun! 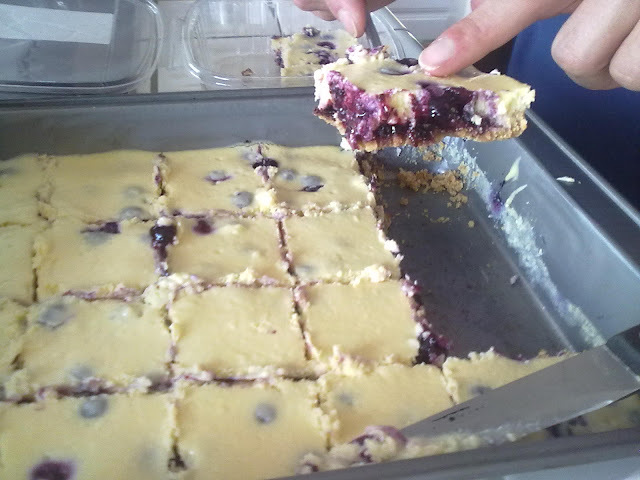 cheesecake bars look delicious. I love blueberries so i'm sure these would be a hit. Hope you made an extra one. I'll be over to pick it up soon.